Tours sell out every year so sign up for site updates, special event announcements and info on our Home Tour + Expo next year! Our Progress + Preservation event spotlighted the urgent need to practice mid-century modern design preservation while also honoring the independent spirits that create contemporary design in Phoenix. This weekend event juxtaposed local attitudes and approaches toward both Midcentury Modern and Contemporary architecture and design. We took the dialogue between past and present to the next level by bringing together a dynamic mix of creative personalities in a variety of midcentury modern-themed venues. 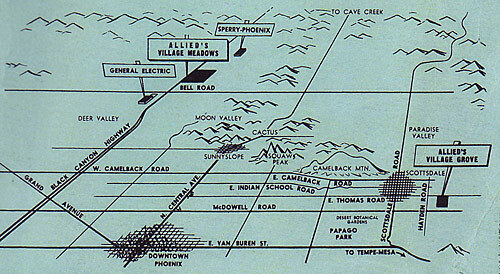 Actual vintage map from Allied Builders, showing Village Grove location. A map of tour homes will be distributed on the day of the event. See the flyer that comes with your tickets for details. Contact Alison to become a door prize contributor or Sponsor in 2009. Door Prize contributions are an excellent way to reach your market of Modern lovers and show your commitment to the Modern Phoenix movement! 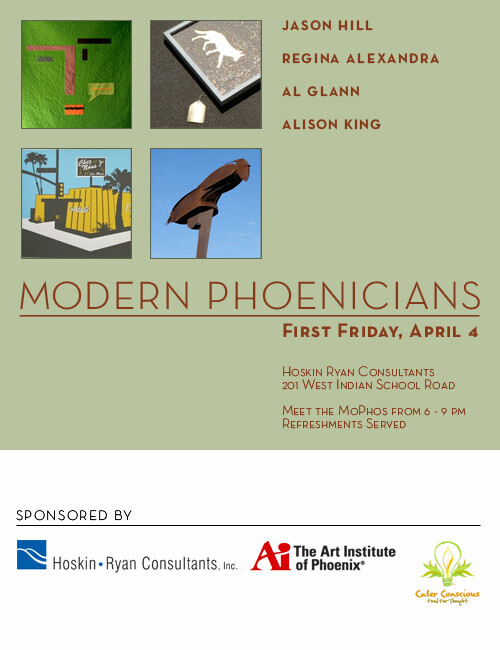 Join us for the official kickoff reception for Modern Phoenix Week this April 4! Enjoy works by four artists and ecofriendly noshes by Cater Conscious in the iconic Valley National Bank Building designed by Herman Jacobi of Weaver and Drover in the late 50s. Come early, the building is beautiful by sunset! 11:30 - 4:30 pm FREE VIEW MAP TO EXPO Free public expo featuring Modern Phoenix Member-owned specialty products and services related to modernism and modern contemporary design including: mid-century modern furniture, real estate, green design, interior design, custom contemporary furniture, design preservation and design education. Contact expo@modernphoenix.net to reserve a table for your business. Free admission to The Scottsdale Museum of Contemporary Art for Modern Phoenix Home Tour Ticketholders, including a special Modern Jewelry trunk show. 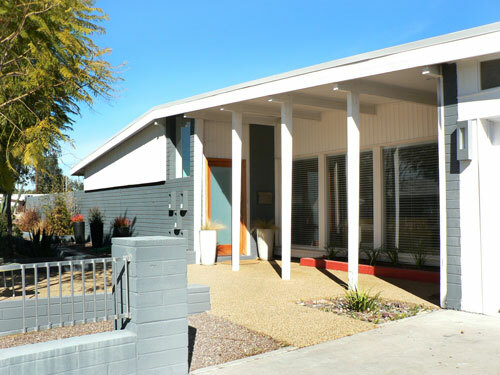 Free information and dialogue on preservation and research of mid-century design at the City of Scottsdale and City of Phoenix Historic Preservation Commission tables. FREE Door prize drawing at 3:30 sponsored by Modern Phoenix members Contact expo@modernphoenix.net to contribute a prize, or attend the expo to enter the free drawing. Must be present at end of expo to win. 4 - 5:30 pm $15 1.5 AIA credit KEYNOTE SPEAKER Frank Henry, Adjunct Professor, Frank Lloyd Wright School of Architecture at Taliesin West The Iconic Age of Modern Phoenix Frank Henry worked for the architectural firm Weaver & Drover for 30 years, is an accomplished architect in his own right, and currently teaches at Taliesin West as a Studio Master. You may know his design work at 44th and Camelback at the old Valley National Bank branch. 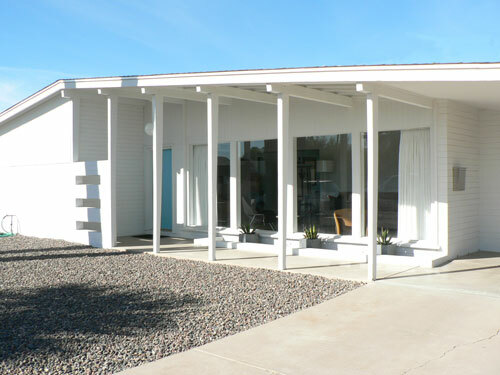 Having participated in Phoenix's Iconic Age of Modern architecture first-hand, Mr. Henry's illustrated talk will take us from the late 50s until the decline of traditional modernism in 1970. Mr. Henry will focus on institutional architecture and the firms and personalities that created some of Phoenix's most iconic buildings. 2 - 2:50 pm $8 1 AIA credit David Tyda, Editor of Desert Living Magazine with guest panel Progress + Preservation in Phoenix Panelists include: James Trahan of 180º, Joe Herzog of [merz] project, Mark Philp of Allen + Philp Architects, Kristine Woolsey of Woolsey Studio and Bill Tonnesen of Tonnesen Inc. David and the panel will discuss issues of development, design and growth in the Phoenix metro area with a focus on each designer's adaptive re-use of Midcentury Modern spaces. 1 AIA credit Debbie Abele, Historic Preservation Officer for the City of Scottsdale Modern Scottsdale Experience Debbie's illustrated slide show about the specific preservation efforts of the City of Scottsdale, which regionally leads the way in MCM preservation. Ralph Haver’s Town and Country subdivision, the Village Grove subdivisions and Scottsdale Garden Apartments designation will be discussed. Social, cultural, economic and design influences on Scottsdale’s development of a mid-century “boom town” will also be addressed. 12 - 12:50 pm $15 (includes materials fee) SOLD OUT Charlie Ray, Designer, The Green Room Cacti and Succulents as Living Sculpture SOLD OUT In addition to leading the indoors out, a principle tenet of Modernsim is bringing the outdoors in. Learn how to create living modern sculpture out of low-maintenance cacti and succulents in this hands-on workshop. Plant selection, dramatic staging, top dressing, potting, aesthetics, and maintenance will be discussed. 12 - 12:50 pm $8 John Jacquemart, Historian Researching Your Midcentury Modern Home using Primary Sources Follow the information hound John Jacquemart through the stages of launching a quest to research midcentury Modern homes and neighborhoods using local resources and online databases. Enhanced by rich illustrations and hands-on exploration of actual historical media John has found, this workshop is perfect for the Modern homeowner wishing to discover their home's history. Saturday, April 12 from 1 - 5 pm Only a fewtickets left! $45 Brandon Gore, Concrete Artisan, Gore Design Studio Concrete Casting 101 Learn the principles of working concrete in this get-messy workshop at the Gore Design Studio. Each participant will walk away with plans and techniques for casting their own concrete coffee table. This hands-on workshop is designed and targeted for do-it-yourselfers, and as such, is closed to professionals in the concrete industry. 2 - 6 pm $25 VIEW MAP TO TOUR AREA A map of exactly where to check in on the day of tour will be mailed with your tickets. Self-guided walking tour through Charles and Arthur Schreiber's Modern Tract Homes of Village Grove. Tickets Available at 480-994-ARTS . ORDER IN ADVANCE, TICKETS WIL NOT BE ON SALE THE DAY OF TOUR. Seven homes designed by Charles and Arthur Schreiber for Allied Builders and surrounding neighborhoods will be open for a self-guided park-and-walk tour. These tract ranch homes feature similar floorplans but several modifications over the years. Low-pitched rooflines, covered carports, cheerful porch posts and block fenestration are all qualities Schreiber's Allied Modern Elevations share. A custom Schreiber-designed home, a Beadle home in progress, and five 60's era churches will also be on tour. 6 - 9 pm Free to weekend participants Retro Cocktail Hour Revisited: Modern Phoenix Afterparty sponsored by Desert Living magazine at Design Within Reach in Downtown Scottsdale.